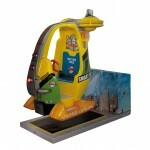 Cogan was founded in 1979 by Nino Malagoli, who had been working for a long time as a Kiddie Rides manufacter. The whole family was shortly involved in the business: Susanna, Nino’s daughter, is the art director of the COGAN products, and her husband Luca Della Rosa is in charge of the company’s management. Thanks to an extensive experience and a telnet for invention, Cogan managed to make some very successful rides which enabled the company to grow into a thriving business; then a good commercial acumen, which is focused on the customer’s needs, and a full commitment to the production, have helped us become a mainstream manufacter. The use of reliable materials, a targeted design phase and an efficient production process allow us to offer our customers a wide range of top quality products ensuring the users’ safety.